The objective of this article is the identification of Paris silversmiths whose activity has been 'forgotten' as their marks were never registered, due to the disorder caused by the French Revolution of July 14, 1789. To my knowledge, these silversmiths aren't listed in any bibliographic record and this article is a small contribute to rehabilitate their activity of skilled craftsmen. Their marks are well presents on silverware owned by French and foreigners collectors, often unsure about the authenticity of their silver punched with unidentified marks never subjected to registration. The marks of these silversmiths are presents on objects produced in Paris between 1788 and 1792, with a punch called "de Bernier" consisting of a letter "P" (for Paris). On November 12, 1788, was registered in Paris a hallmark with the letter "P" under a royal crown and a well readable thousandth "88". 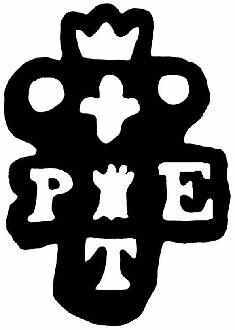 This hallmark is also described as "P 88". - discharge mark (poinçon de décharge), a vine's or oak's leaf (meaning that the tax was paid). 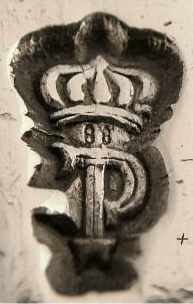 On September 5, 1789 was activated a new hallmark, the letter "P" under a royal crown and the thousandth "89" (this mark is described also as "P 89"). Notwithstanding the silversmiths' guild of Paris was abolished in March 1791, this mark continued to be used until April 1793, when tools and all precious metals were confiscated to the silversmiths during the "Terreur". 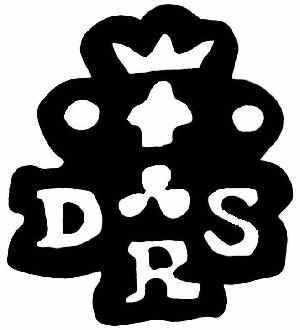 Only in 1797 a new hallmarking system was reintroduced. This was a troubled period in the history of France, complicated by various controversies between silversmiths and the royal authority. The result was that in 1789 numerous silversmiths avoided to register (becoming "forgotten silversmiths") and others left in their marks any representation of the old monarchy (1791). 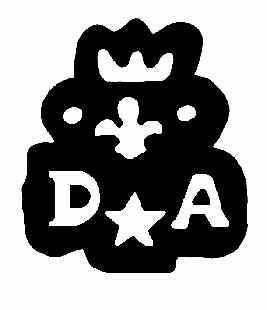 Mark = DA and star under crowned fleur de lys. Silversmith's mark found on flatware bearing "P 89" mark. Mark of this silversmith isn't recorded after 1798 (period "au 1er coq"). Mark = (D trefoil S) under crowned fleur de lys, R on the bottom. Silversmith's mark found on silverware bearing "P 88" mark. 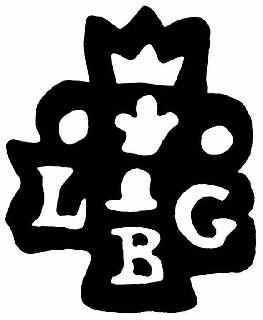 Mark = (L unidentified symbol G) under crowned fleur de lys, B on the bottom. Silversmith's mark found on silverware bearing "P 89" mark. Mark = (P a sheaf E) under crowned fleur de lys, T on the bottom. Silversmith's mark found on various silverware pieces bearing "P 89" mark. 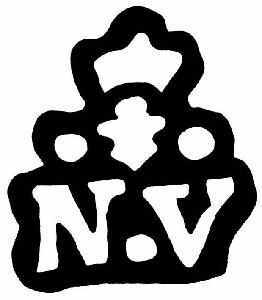 Mark = (N dot V) under crowned fleur de lys. It's a second not registered mark either of Nicolas Vial (entered in 1781, still quoted in 1793?) or of Nicolas Vatinelle entered in 1769, still quoted in 1791?). 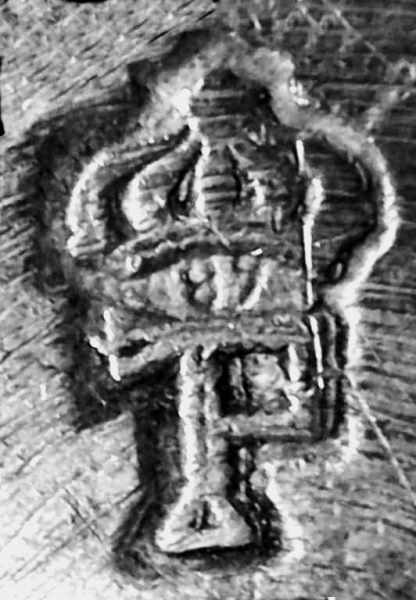 Silversmith's mark found on a piece bearing "P 89" mark. The mark can be truncated. This silversmith isn't quoted as active in 1798. 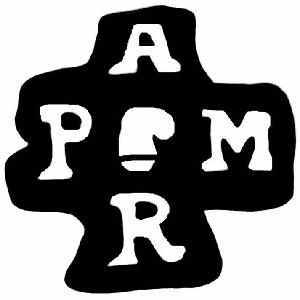 Mark = A over (P revolutionary cap M), R on the bottom. Silversmith: Augustin Philippe MOCQUIN, said "Rogeland", entered in 1771, quoted as active in 1793. His previous 1771 mark is unknown. Mark found together with "P 89" mark. 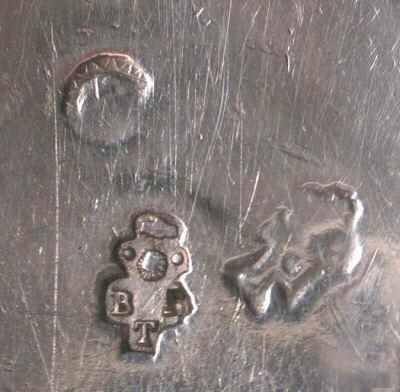 Silversmith's mark not identified, possibly BTT without the royal symbols of the 'Ancien Régime' (fleur de lys and crown). Mark "P 89", charge mark rubbed, letter "A" inside an oval. This silversmith was still active in 1798. No further information is available. Most of the observations cited in this article were made after the examination of pieces of minor silverware (spoons, forks, little cups). This minimizes the possibility of counterfeits. Despite its historical interest, the study of French revolutionary period and its silverware production remains largely unexplored.